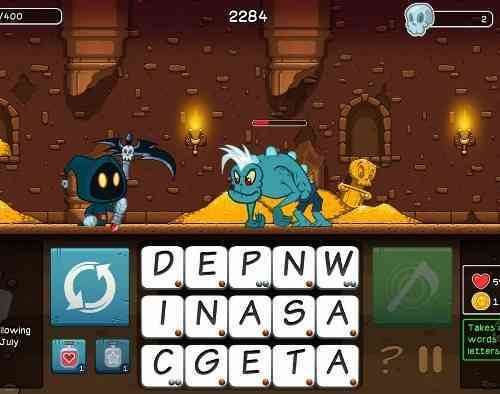 As a lover of the puzzle genre, and even more so of word games, I knew that Letter Quest: Grimm’s Journey Remastered was a game I needed to play! 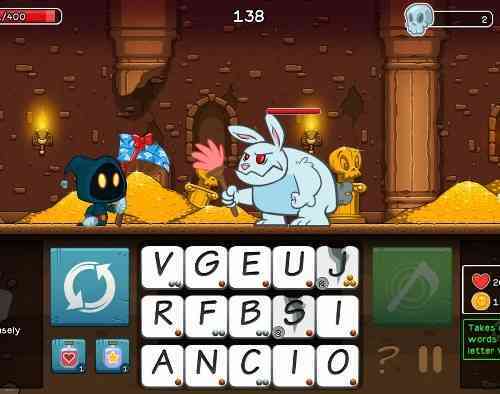 Challenging at times and fun the whole way through, Letter Quest: Grimm’s Journey Remastered, or Letter Quest Remastered for short, is an awesome word game. There is a lot of game to play, and along with the comics about pizza, catchy tunes and simple controls, there isn’t much to complain about. You begin the story as a cute little grim reaper named Grimm, battling against countless monsters to prove that the power of words can defeat any enemy that dares to challenge you. 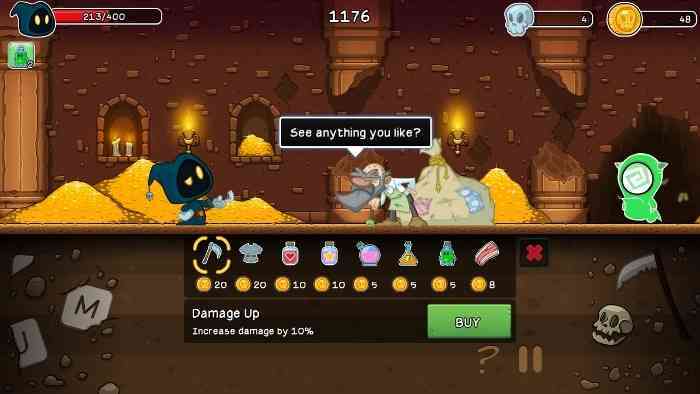 You collect gems by killing these monsters, and rescuing shop keepers, which are then used to buy upgrades. These upgrades range from health and damage power ups to new weapons and books that can be used for game bonuses. Each of these books can be leveled up as you gain experience for them, making you much more powerful as the game progresses. There is also an unlockable character names Rose, a red grim reaper just as cute and deadly as Grimm, that becomes available later in the game. 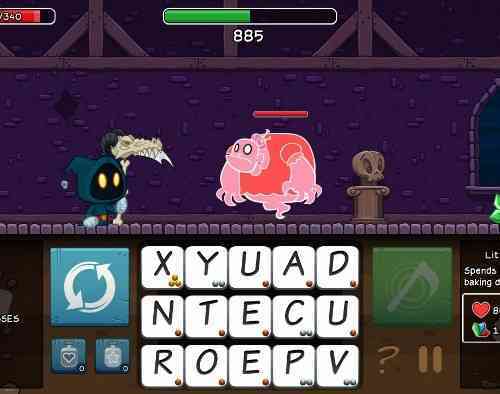 While Letter Quest Remastered does not have a multiplayer experience, there is plenty of game to be played through. 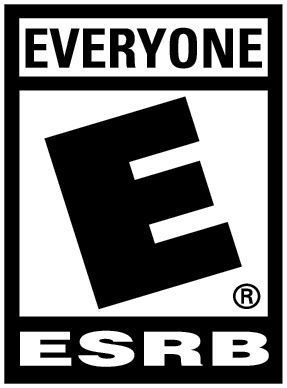 Each of the 40 levels can be played over and over, with four stars available for unique challenges and objectives. The first star is awarded for completion of the level, and the second star is awarded for beating the time trial. The third star involves a challenge of varying difficulty, examples of which include playing the level without the use of certain letters, and monsters with increased health. The fourth star is known as the crystal star, and it often requires more skill and power ups than the first three stars combined. 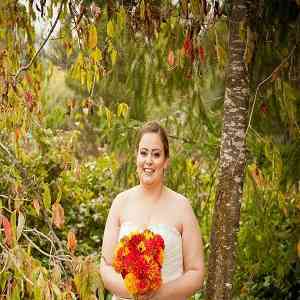 There are also quests available, that award you with extra gems upon completion. There is a second game mode available called endless, which is exactly what it sounds like. The objective of this game mode is to see how long you can survive against an endless onslaught of ghosts, evil bunnies and other interesting monsters. After defeating a couple of monsters, a shopkeeper will be available to buy a few items from, including health potions and shields, but be aware of the gem cost per item as it can mean the difference between life and death! The best part of endless mode is that you get the opportunity to customize your experience, choosing your favorite letter tiles, background art, weapons and music. While there is a large vocabulary available, hundreds of words in fact, I am rather disappointed by the lack of recency of the vocabulary. Let me explain. 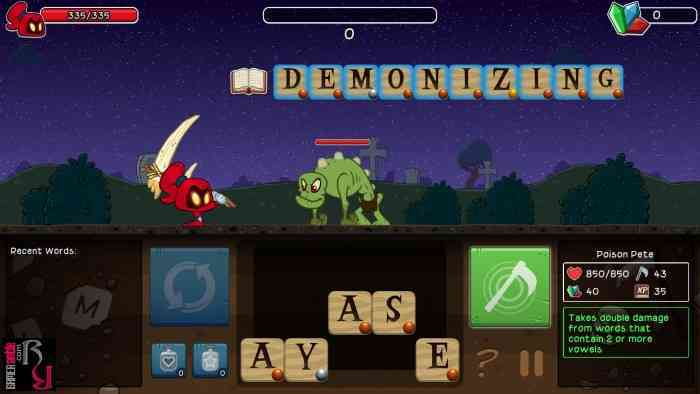 There were words I used that were not considered a word in Letter Quest Remastered, even though it is in this years dictionary. Of course I’m drawing a blank now for an example, but there were a few times where this happened, and before you ask, no I was not using words from the urban dictionary such as bae and yolo. 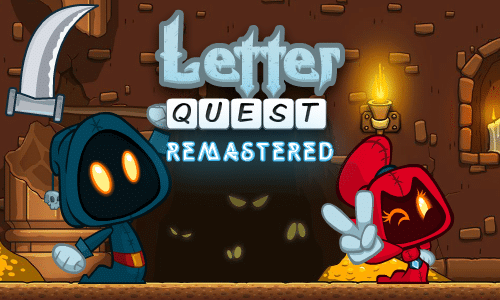 The only other negative about Letter Quest Remastered is the repetition due to the lack of differences between the levels. 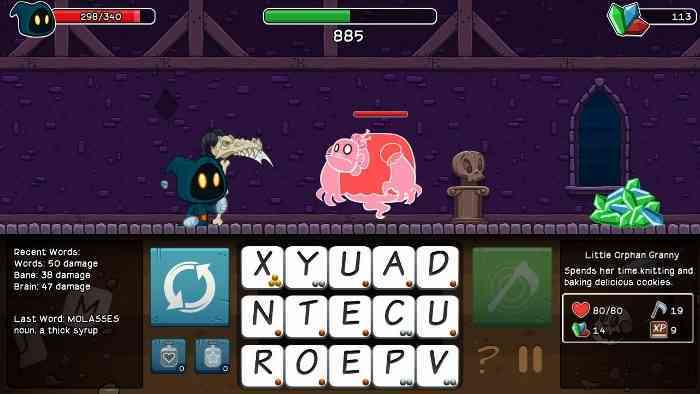 I can and do appreciate the attempts by Bacon Bandit Games to break this repetition up by adding in different tile abilities for the variety of monsters, and while it helped, it did not get rid of the repetition altogether. The computer AI were animated and behaved exactly how they were meant to. Each one had a humorous description about who/what they are, and I felt these little descriptions added to the enjoyability of the game. The controls are simple, and the graphics are crisp. Every part of the game was laid out nicely, from the levels themselves, to the upgrade screen, making the game both easy to play through, and visibly appealing. 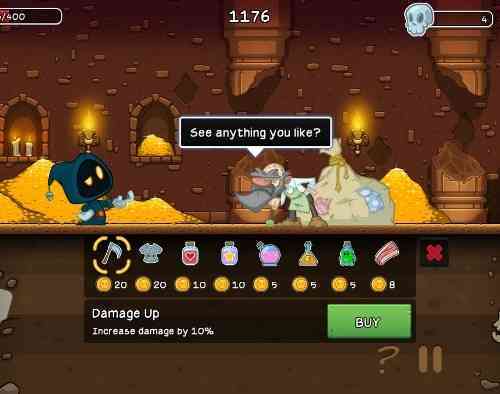 The soundtracks, both the original and the updated, made Letter Quest Remastered fun to play, and I liked the ambiance it lent to each level. Letter Quest Remastered is definitely worth your time with an abundance of content and customization features, a sweet soundtrack and simple controls. 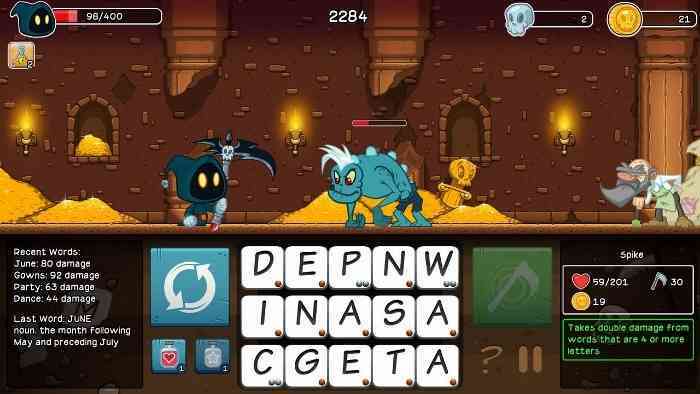 As a combination between an RPG and word puzzle game, Letter Quest Remastered uses word knowledge and strategy to defeat numerous monsters on your journey to victory! 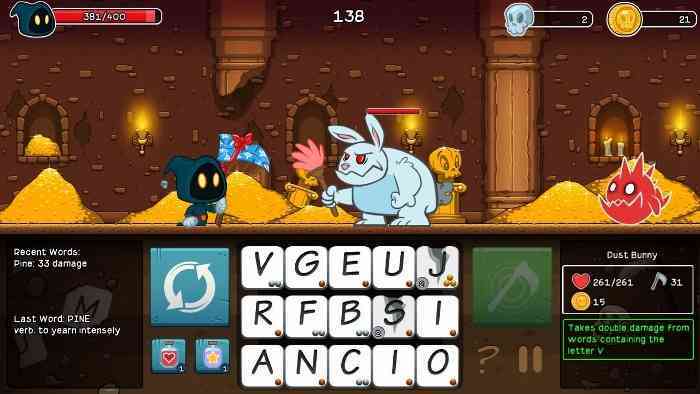 Letter Quest Remastered, without a doubt should be on your list of must-try games, regardless of whether you are a fan of word puzzle games or not.